Black Winter Truffles are wonderful when cooked. Their flavor and scent will be strongly infused into the dish. White Winter Truffles should NEVER be cooked, since they lose their aroma rather quickly. Truffles are subtle and powerful at the same time; they need to be handled with the utmost attention in every recipe. Truffles impregnate their intense aroma and flavor to the food around them; therefore they should always be used with ingredients that are accommodating to these strong qualities. The resulting dish should be a combination of carefully chosen elements and simple cooking, working together to emphasize the complex, fine notes of the truffle. 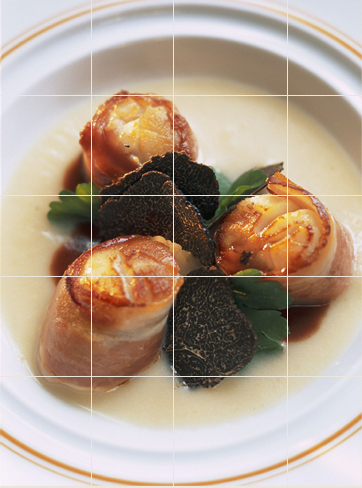 Regardless of the dish, truffles should always be the “center of attention”. Never mix truffles with ingredients that have strong aromas or flavors since this will overpower the truffle’s qualities, a true recipe for disaster! Truffles should be optimized and used sparingly, it is highly recommended to shave them, peel them or slice them. Small quantities will transform a basic dish; as a reference 8 to 12 g per person are enough. Any less will create a disappointing culinary experience. Depending on the recipe, truffles might be used peeled or unpeeled; in the first case always save the peel for later, this is will be a fantastic ingredient to be added in sauces or on top of a dish. To enhance the flavor of preserved truffles, use a Truffle Oil or Truffle paste. 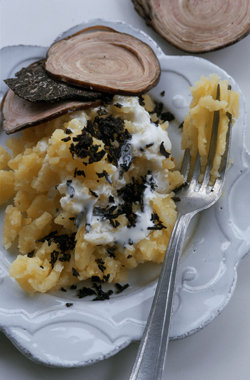 Pasta, rice and potatoes are some of the simplest, most common foods and they work marvelously well with truffles. Fat such as foie gras, cheese, oils, butter, etc. 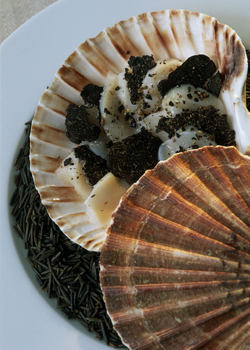 enhance the truffle’s flavor and create an overall harmony of texture. Black Winter Truffles are wonderful when cooked. Their flavor and scent will be strongly infused into the dish. They also create a good contrast with vegetables such as celery roots and leeks. White Winter Truffles should NEVER be cooked, since they lose their aroma rather quickly. They should simply be shaved, grated or sliced over a hot dish like risotto or pasta and added at the very end of the preparation. Also, they should not be mixed with ingredients of high acidity since they will subjugate the truffle’s flavor. For Summer White Truffles, use the same approach as with White Winter Truffles, although —because they have a less intense aroma— there is more flexibility when it comes to cooking them. Summer Black Truffles are the less expensive among the top truffle varieties. They should basically be handled the same way as Black Winter Truffles, however, their more affordable price and less pungent aroma makes them a great option to experiment and try different recipes.